(2012) Written by Scott W. McKinlay and Jim Bartoo with additional material by Adam Jahnke and Ian Michaels. This movie became a favorite of mine because it takes me back to a time when owning a crappy car and having a crappier job in my later teens was my normal day to day. And it makes no apologies in being what it is, and that is just a little less than an hour and a half brain break. 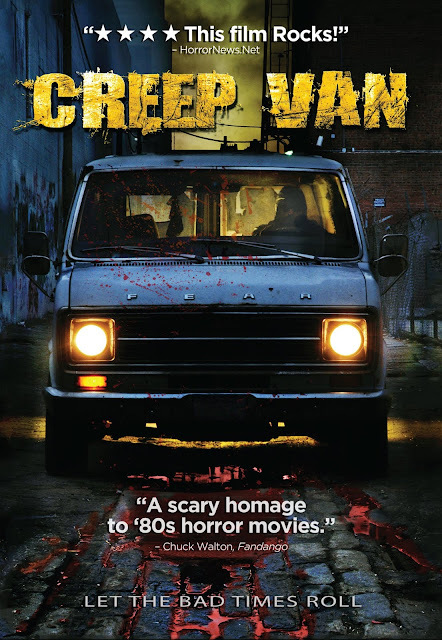 There's not much of a hard plot to follow "The Creep" (Mike Butler) drives around in his rolling chamber of horrors killing whoever comes along. And while that is going on a man by the name of "Campbell Jackson" (Brian Kolodziej) takes a job at a car wash falls in love with a girl named "Amy" that works there, and has to deal with coworkers he can't fit in with. And soon his path crosses with The Creep when he sees a FOR SALE sign in the window The Creep's van as he takes the bus to work. He calls The Creeps number and after just getting his answering machine one time to many changes his mind about buying it. This sets off The Creep and has him setting his sites on Campbell and his love interest Amy. But all's not lost because Campbell has "Swami Ted" (Collin Bernsen) on his side. I'll let you find out who he is when you watch it, and all I'll say is Collin Bernsen is beyond funny in the role. Lloyd Kaufman makes a cameo as a disgruntled customer at the Car Wash (Since he is the man that influenced a whole generation of these movies). 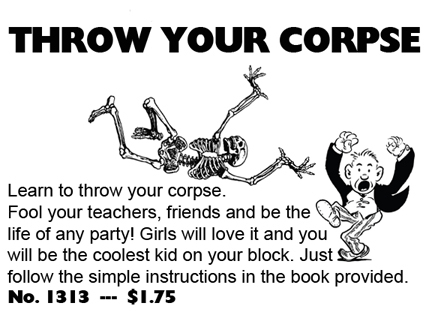 And there is enough off the wall humor along with top notch gore to keep you happy. 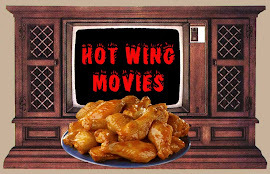 I have to warn you that the movie is not for every horror fan out there, but it definitely delivers to those that get it. 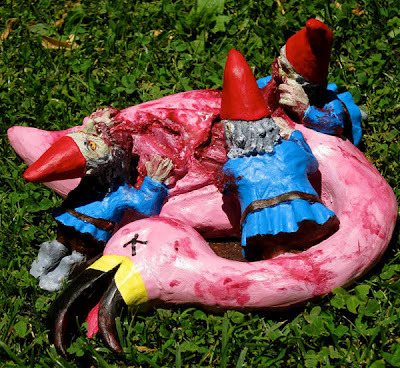 Beware of The Garden Gnomes! 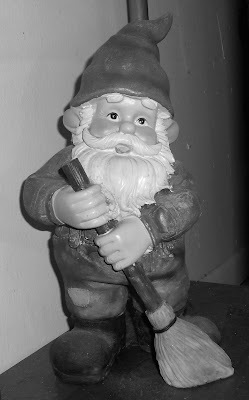 It's funny how the internet is claiming "Garden Gnomes" are the latest craze, when they've popular for decades since they were first created by German Sculptor Phillip Griebel in the late 1800's. And yes they do have a place in The Storage Unit of Terror. And maybe it's my subconscious contribution to Earth Week since they're very much tied into it. I've personally had a love for them since the first time I ever saw one way back whenever. And I think it's funny that others find them creepy or just plain scary (There's your monster tie in). 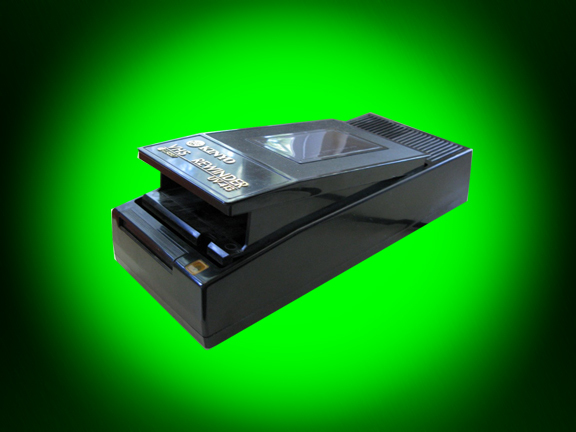 I still have to get one of these for my collection. 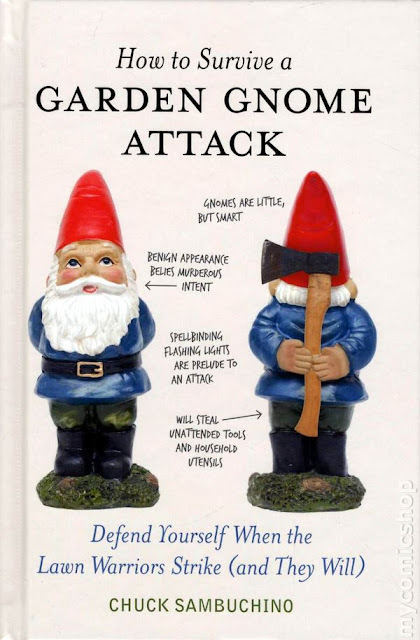 book "Revenge of The Lawn Gnomes"
What's even funnier about my liking of them is I am not into gardening at all. To tell you the truth I can't even get near the stuff. 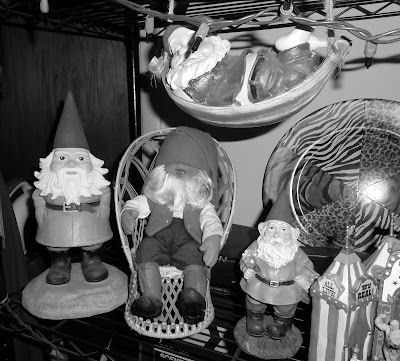 So my Gnomes like to hang around, watch TV and do whatever they like when they come alive at night. "Dude did you just say watch TV?" 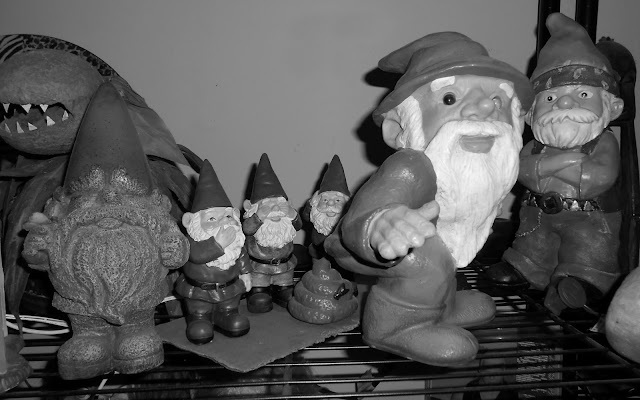 Well yes I did, and the reason I said it was my wife and I have quite a Gnome collection of all sizes. So pull up a chair and I'll tell you the tale of how that came about. Back in the 90's I worked in a Comic Book Shop with a great group of people. We all had the same sense of humor and would laugh till our sides hurt coming up with all kinds of parodies about stuff we liked. Then every once in a while if times lined up everybody would get together for a movie night. 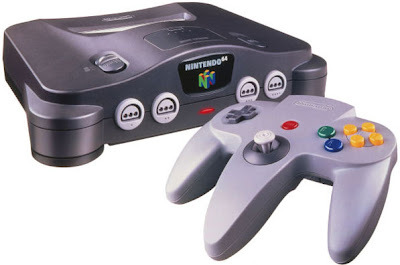 But one times was when one of the gang had bought the newly released Nintendo 64. 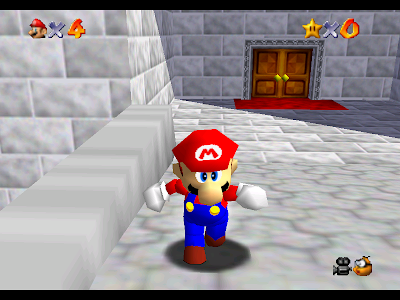 And on one of the levels poor Mario was stuck in a loop running over the tops of a bunch of mushrooms. We started laughing about it because it was a whole new system with the same old problems. 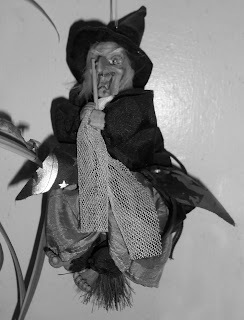 And then our friend Rob X. Román yelled in a character voice "Look at me I'm The Garden Gnome hoo ha!!!" That just turned the funny all the way up to eleven! Another thing going on back then was everybody blaming the storm system El Niño for just about everything. Lost your car keys? It was El Niño's fault, so on and so forth. 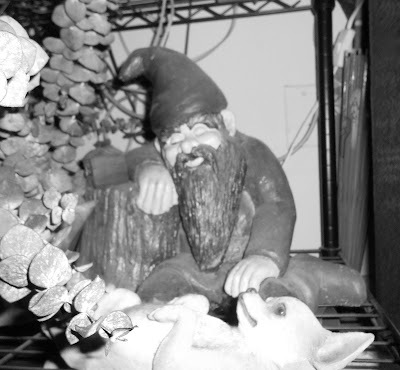 Well at the Comic Book Shop it became The Garden Gnomes fault. 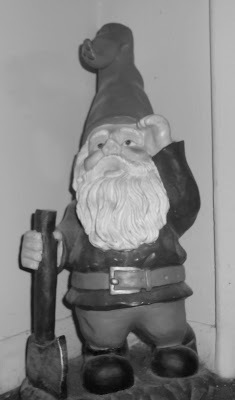 If the toilet overflowed we would say "It was me The Garden Gnome!" And of course it would have to be said in that voice. After that first day of saying it I never really gave Garden Gnomes much thought, I mean I liked them but they were just in the background. 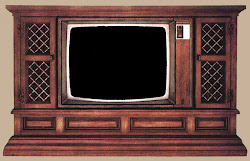 Then after Rob's joke they were everywhere, I saw them in stores, yards and on just about every TV show that week. 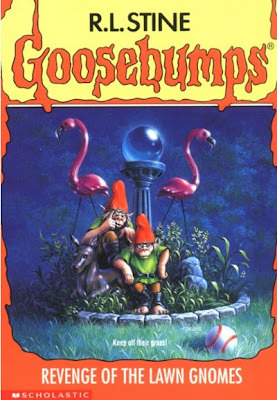 Faulty Towers had one (That caused Manuel to get punched in the face), Third Rock had one, Chet from the Weird Science TV show had an arm full of them and yelled "Garden Gnome!" 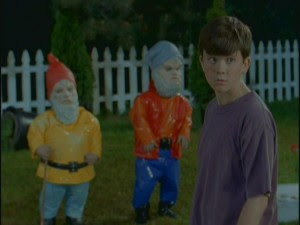 (Because he was stealing them), The Garden Lady that used to be on Regis and Kathie kicked one in a garden on an episode (And she was gone a few days later), And The Goosebumps "Revenge of the Lawn Gnomes" episode aired. Rob and the gang thought it was really funny that I was over noticing them, until we got that weeks shipment and the issue on top was "Garden Gnomes Attack!!!" 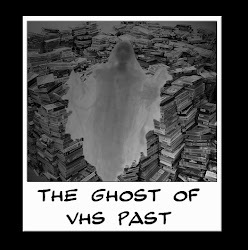 I wish I could find the cover for it all I can remember about it was it came out in 1996. I had told my friend Dawn about it and she thought it was really funny. Then two weeks later she had brought me "Larry" pictured above as a gift from Florida. Turns out her brother has a thriving lawn ornament making business and "Larry" was one of his creations. This started my wife and I on our Garden Gnome adoptions. I'm not going to list every one we have, but I'll give you a couple highlights. 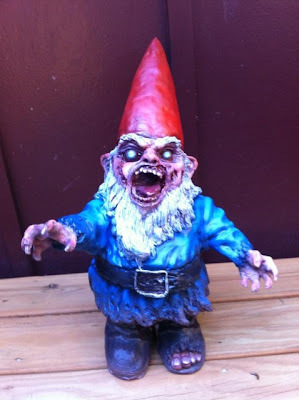 Had to have "The Roaming Gnome"
Making Indie Horror Movie Making a little easier. 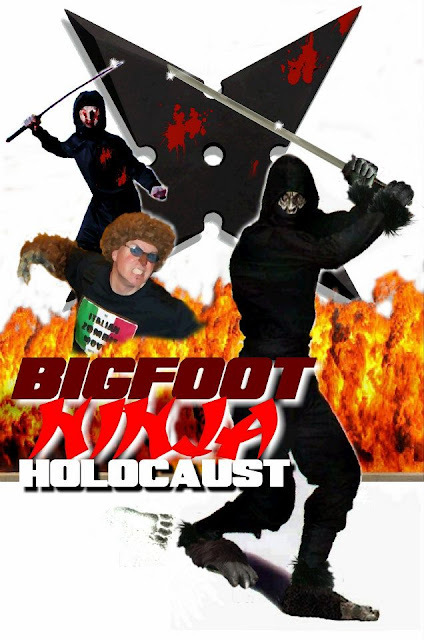 So you decided to make your own Indie Horror movie. You wrote a script, saved any extra money that you could get your hands on, bought a HD Camera, a decent microphone, and an editing program. Now you're going to need to get a video crew together and of course your talent (sometimes they'll be both). Of course that's going to be more money, because if you can't pay them the polite thing you can do is feed them. Pizza places usually run specials and it's a low cost way to be accommodating to everybody. 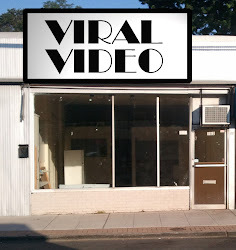 You were lucky enough to secure your shooting locations and found a local Party Supply Store that carries fake blood (Unless you make your own) and F/X makeup supplies year round. But you still need costumes and props and you've just about used up all of your budget. What do you do?! 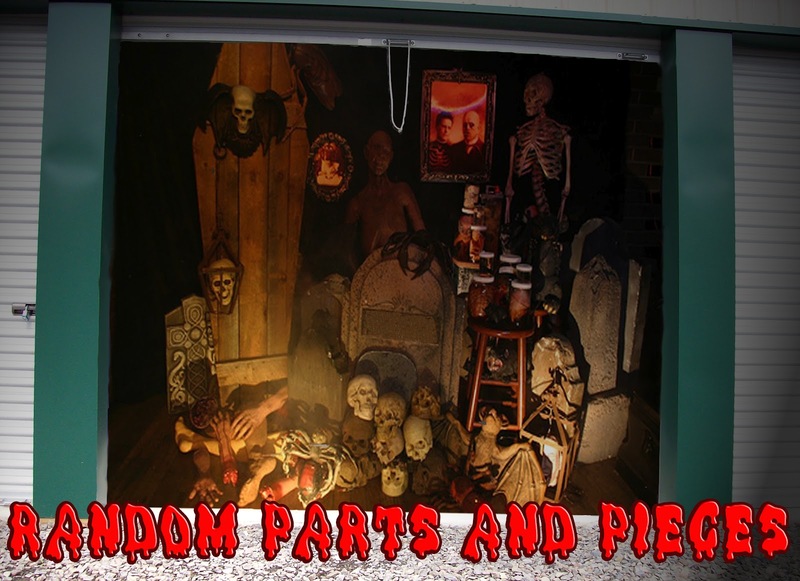 Well you go to the nearest Thrift Store and turn it into the best Costume and Prop House ever!!! Believe me I have allot of experience in this. I've supplied The Costume Shop, decorated haunts and made movie props with allot of the stuff. Thrift Stores are the best because you can get great stuff at a low price, because the owners have a overhead and don't want anything staying for too long. And since these items are the owners livelihood they check everything over before it goes on the racks. On top of that if you give the owners loyal business they'll give you deals allot of the time. I have a great friendship with everybody at "Bo's Attic" in Middletown and find allot of what I need there. 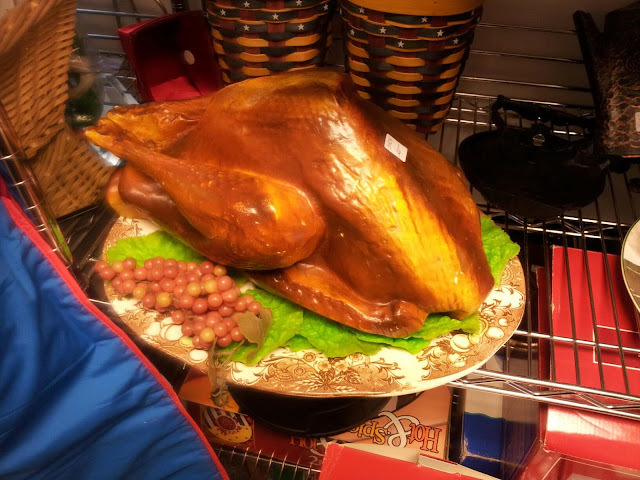 Where else are you going to find a full size prop turkey for twenty dollars? 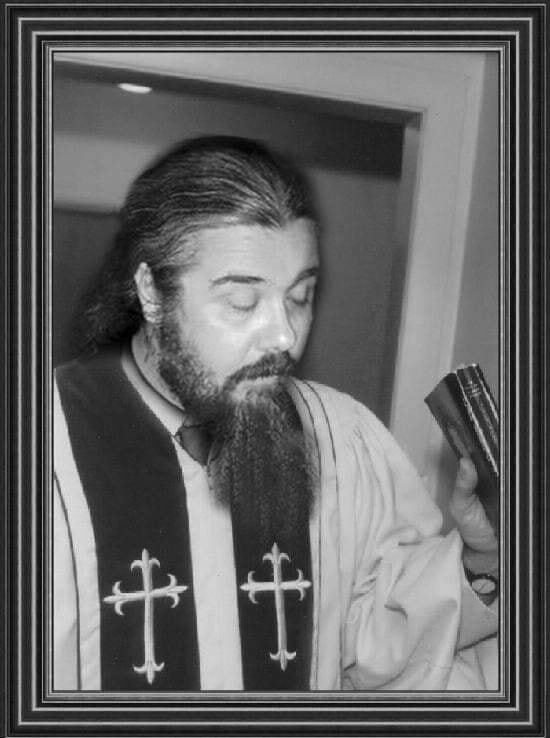 Another Thrift Store I go to allot is "St. Ann's - Project Paul" in Keansburg. There's lots of cool stuff there too, but allot of people in town need what they have so I only go if it's a hard to find prop or clothing item. Then there's St. Agnes Thrift Shop in Atlantic Highlands where the three story Victorian house it occupies is worth seeing alone. And there's even more in Matawan, Keyport, Red Bank that I go to. When I'm in Cliffwood "The Good Will" is where if I don't get props I wind up finding really cool collectables. 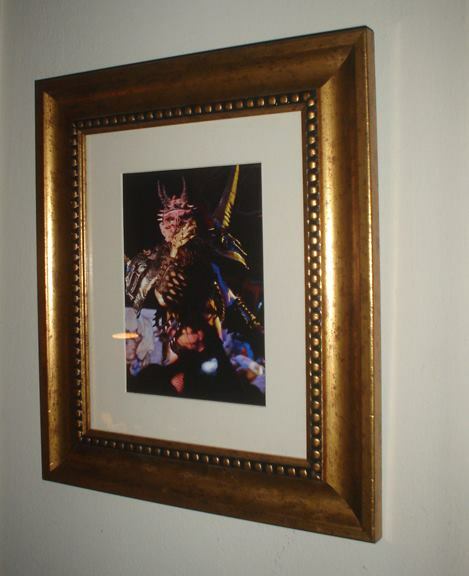 I actually found and bought a matted and framed picture of Oderous there! 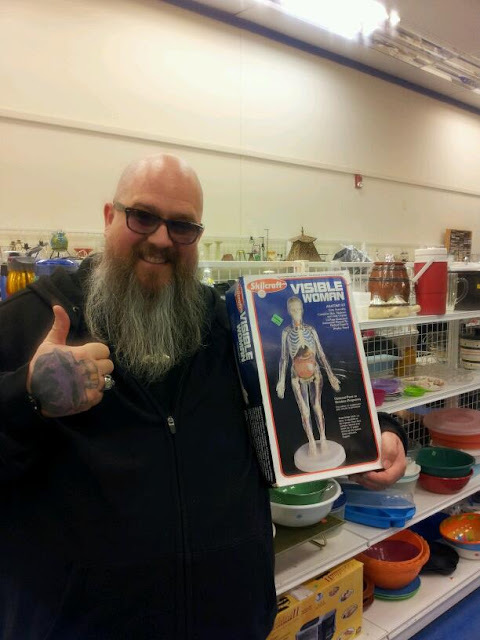 And check out my "Visible Woman" model kit! She's complete, but I have to still assemble her. And if you keep a good relationship with the owners and employees they'll let you know about specials and keep an eye out for items you're looking for. Outdoor Markets have allot of cool finds too, but you really have to know what you plan on spending and make connections. Because thanks to all of these Pickers and Pawn shows allot of the sellers at them become Antique dealers. The best thing about getting wardrobe from a Thrift Store is they are perfect for horror movies.The clothes can get trashed and bloodied without worry, and make excellent zombie wear. One trick I've learned is zombie suits and dresses can have that out of the grave look by spraying them with spray mount a section at a time. And when the spray mount is tacky dust it with baby powder then rub it with your hand. When you do that the spray mount gets all stringy and pilly so it looks like dried cob webs. There's a ton more tips and tricks to age and distress wardrobe readily available on the internet, but that one was always a favorite. And there is a ton of old toy water guns and sports equipment that can be modified to become all kinds of Sci-Fi weapons and outfits. And you can find more than enough computer and electrical components for set and spaceship interiors. 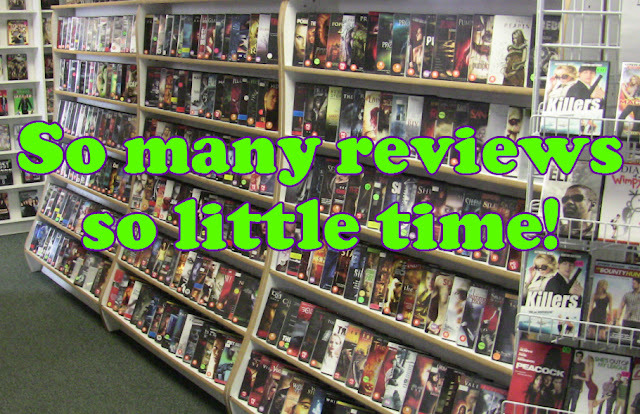 There is just about anything needed for just about any movie, all you have to do is look through the racks. 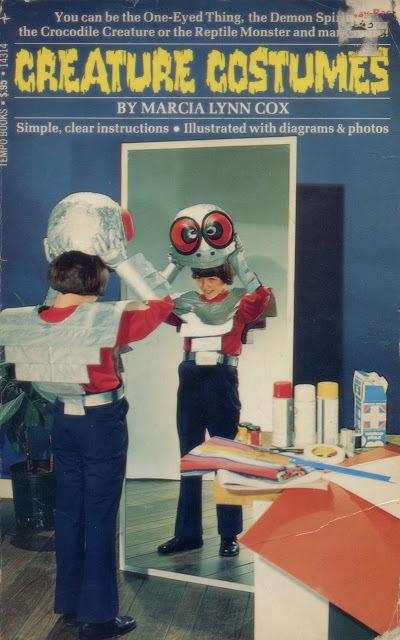 I have to start by thanking Tim Mitchell at Titans Terrors & Toys for indirectly helping me find two books (along with their photos) that changed my life forever. 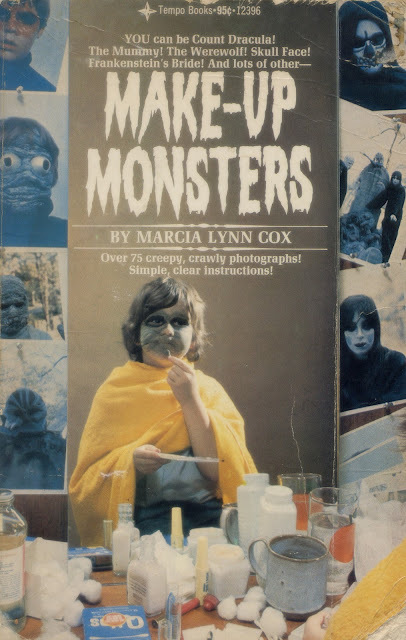 And Marcia Lynn Cox for writing these books and getting me started on a great life long adventure. Both of these were read and loved until they completely fell apart. 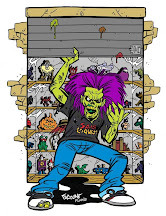 It just amazed me how I could make myself look like quite a few of the monsters from Famous Monsters with stuff around the house or readily available at any drug store. And not only did I try a few of them out back then, I still used allot of Marcia's techniques for quite a few F/X jobs later in my Indie Horror career. There was the Knox Unflavored Gelatin and Red Food Coloring Stay Put Blood and a great recipe of flour and water with popcorn kernels to make great chemical or acid burns. 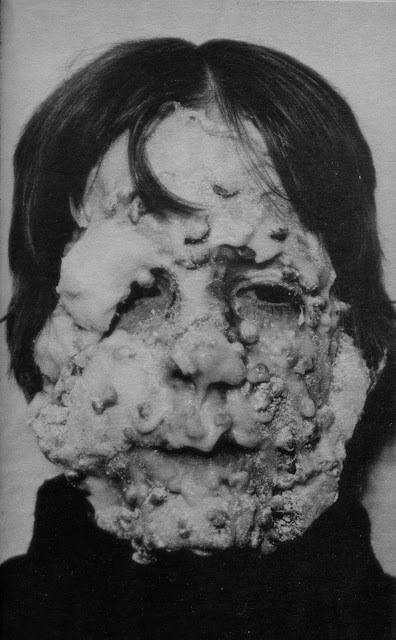 To give it depth you would glue cotton balls on the persons face first then apply the mixture over it. 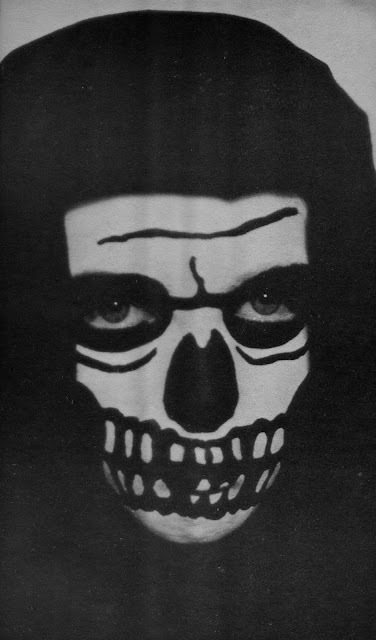 And when I was eight I was able to do the skull with Halloween Makeup that years later would be fine tuned and taught to me by a F/X makeup artist named Patty and would for ever be known as "The Patty Skull" at "The Costume Shop". 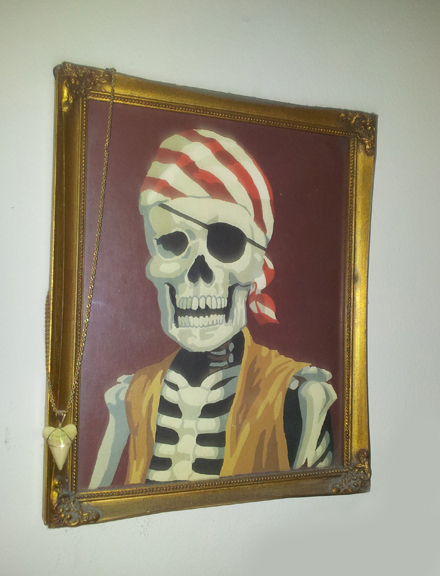 Now for the doubters that say I couldn't do that back when I was eight, I can tell you that I did this Paint by Numbers Pirate Skeleton when I was eight and still it have to this day. Then there were all of the trips to Red Bank when it was still more of a Artistic and Entertainment hub. And the home of The Magic Shop and The Costume Shop. And these would be even more of an influence on me wanting to be part of Monster movies in some way. My mother would take me to The Magic Shop and it was just that. Just imagine any and every magic store you had ever seen in a movie and this was it. They had a full size guillotine, large foam boulders and trick quarters nailed to the floor. And any and every slight of hand and large illusion you could think of as well as a ton of gags and novelties. Yup, dribble glasses, break away spoons and hand buzzers. This almost had me taking the path of a professional magician, but I guess fate had other plans. 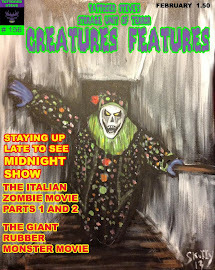 I had written about when I was ten and had seen Friday The 13th with my mom in the movie theater and was introduced to Tom Savini by Famous Monsters Magazine. But I forgot to mention that I had also discovered another magazine by the name of FANGORIA that same year. 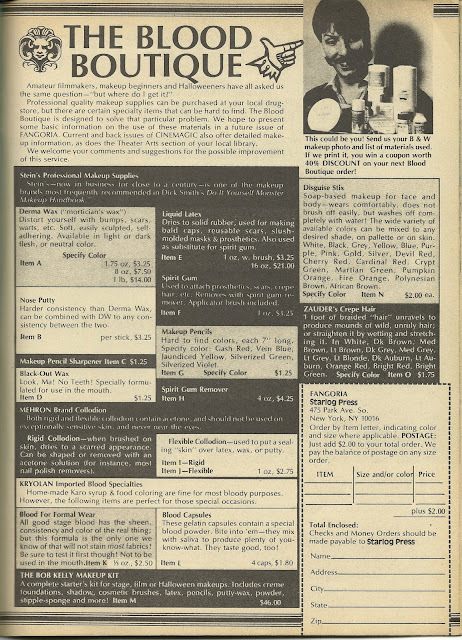 And in that magazine was an ad for the Blood Boutique when I was thirteen. I would save up any money I could get and send away for mortician's wax, latex and fake blood to try and recreate all of the gore and more in the pages of the magazine. 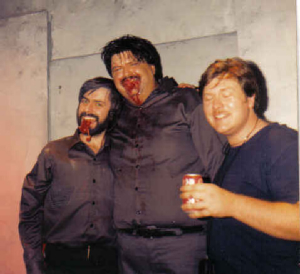 Who'd have thought that years later I would have met and became friends with Tim Ferrante (one of the original writers for FANGORIA) and The creator of "Drive In Madness", James Murray and Nick Pawlow along with Happy Goldsplatt from "Prevues From Hell" and "Celluloid Bloodbath: More Prevues From Hell" and Tom Savini himself. Another great thing about Red Bank was I had the chance to meet and be mentored by Gravely McCabre himself when he had an entertainment company where I had learned everything from stage makeup, to costuming to prop building and set design. 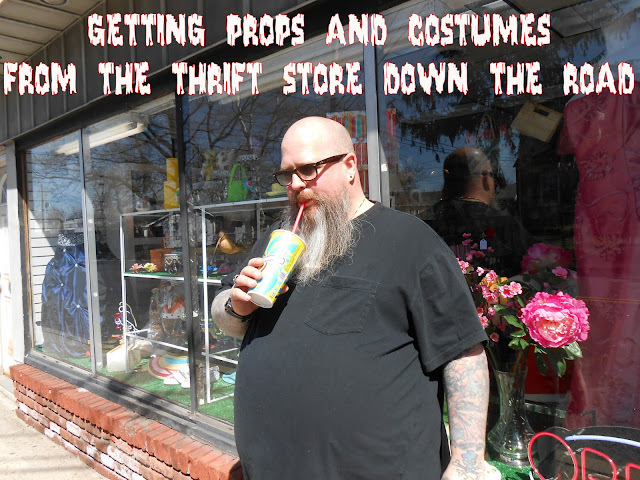 The Costume Shop in Red Bank was a huge part of my life and was another place where I furthered my training in F/X and became a Professional Horror Clown. And was a live entertainer as well as a F/X hired gun for more straight to video horrors than I can count. 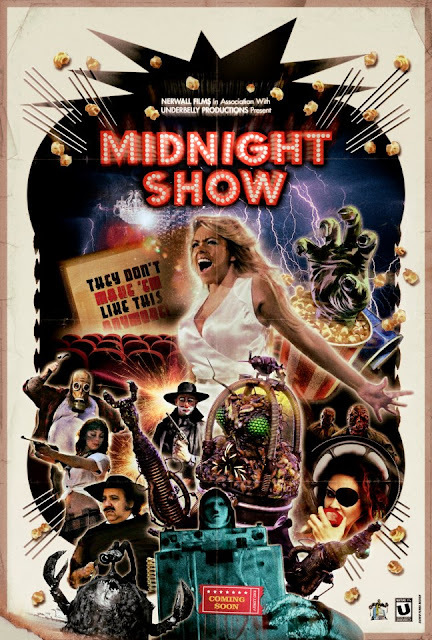 And led to me getting to meet and become friends with F/X Artist Tony DeBartolis who's work is now being featured in Newt Wallen's movie "Midnight Show", and in a upcoming Thomas Berdinski feature. All of this had led me to my meeting with writer director Warren F. Disbrow. 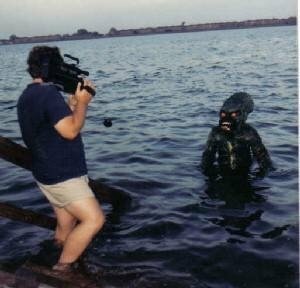 Warren was hired by Samuel Sherman to film new sequences for "The Bloody Dead" (Which in Europe was called "Creature With The Blue Hand"). 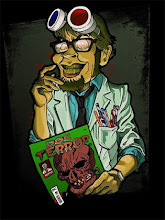 Warren had done a taped footage of Samuel M. Sherman for Tim Ferrante's "Drive In Madness" where he talked about making Dracula VS. Frankenstein. Samuel and Warren had struck up a conversation and when he found that Warren was an experienced filmmaker with his own equipment he offered Warren the work of filming the tie in's for the American re-edit version. Warren had taken the job and had hired my Uncle Bob as a large cannibalistic cellmate of F/X Artist Ed French. This is when my Uncle Bob had told Warren about me wanting to get into horror movies in the worst way. Now could have easily given him a polite nod and just left it at that. But he didn't and had given my Uncle Bob his business card and told him to tell me to set up a meeting. We had hit it right off and Warren had offered me a position in his movie company as a production assistant. That had led me to be in quite a few of his horror movies. I was still involved with The Costume Shop and some years after working with Warren. 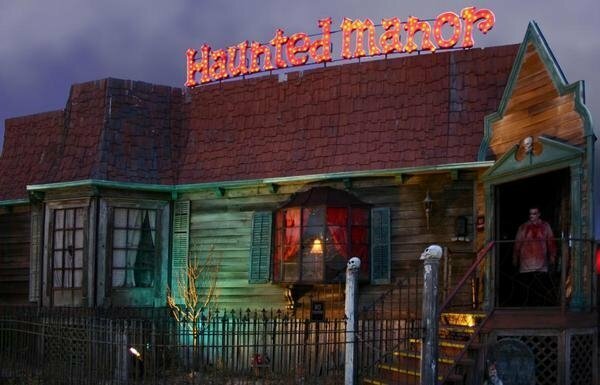 I had met Stan Ambro and was able to spend a few years with his Hollow Graves Haunted Manor. And just when I thought I did everything there was to do, Newt Wallen had cast me in "Midnight Show" as a killer Redneck! I can't wait to see where it goes from here! My salute to Home Made Horrors! 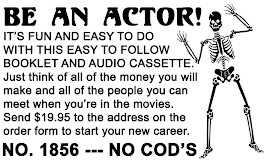 A salute to horror magazine merch ads. Links to other sites you have to visit! All images, unless otherwise noted, were taken from the Internet and are assumed to be in the public domain. and noncommercial and the material will be removed immediately upon presented proof. ©2019 Tattooed Steve LLC. All rights reseved. Simple theme. Powered by Blogger.